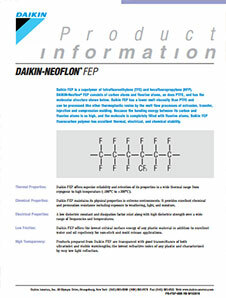 NEOFLON™ FEP NP-101 by Daikin is a perfluoroethylene propylene (FEP) copolymer of tetrafluoroethylene (TFE) and hexafluoropropylene (HFP). Possesses low dielectric constant, dissipation factor with high dielectric strength over a wide range of frequencies and temperatures. Exhibits high performance, low melt viscosity, high transparency, resistance to weather-, chemicals-, moisture-, light-, flame- and permeation. Shows non-sticking properties, electrical reliability, low reactivity, low critical surface energy, thermal- and chemical stability. Suitable for high speed extrusion of thin coatings of small wire sizes and injection molding of thin wall parts. Recommended for small tubing, high speed wires and cable coatings. NEOFLON™ FEP NP-101 complies with FDA 21 CFR.177.1550, ISO 9001 (Quality System), ISO 14001 (Environmental System) and Responsible Care 14001 (Safety, Health, Environment and Security).